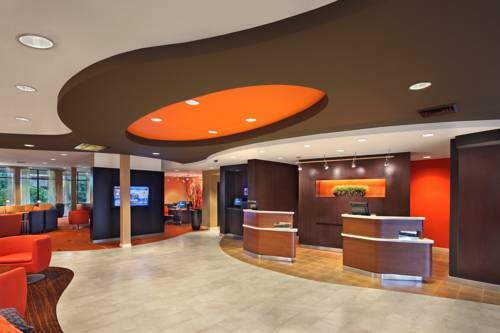 The Courtyard by Marriott Providence Warwick features accommodations perfect for any Rhode Island traveler. This Providence Warwick hotel features an updated lobby & is close to Downtown Providence, the RI Convention Center and T.F. Green Providence Airport (PVD). Complimentary shuttle offered from 5am and 12 am within 5 mile radius. Courtyard Warwick Providence guests enjoy easy access to Newport, Providence, Foxboro s Gillette Stadium, home of the New England Patriots, & the Dunkin Donuts Center, home to Providence Bruins Hockey team. Visitors looking for a hotel near Brown University, Providence College, Johnson & Wales, and the University of Rhode Island find the Courtyard Providence Warwick an ideal location. Beautiful RI beaches, Twin River Casino, and the unique Providence Waterfire experience are also near our Providence Warwick hotel. Stay connected in our hotel with complimentary high-speed Internet & Business Center & stay fit with our heated indoor pool & fitness center.